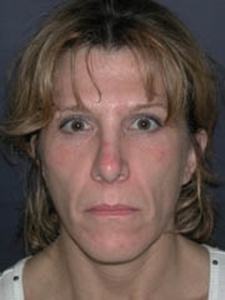 This is a 43 year old female who had severe acne as a teenager. This produced numerous acne scars and loss of fat in the face. Initially, we were able to use fillers in the cheeks. 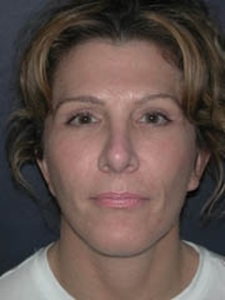 However, over the years she was noticing more laxity in the skin and the fillers were becoming less effective. She finally decided to try surgery for a more permanent and better result. 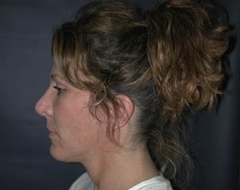 She underwent a neck lift with tightening of the neck muscles. A deep and superficial facelift was performed. Fat was taken from her abdomen and inside of her thighs and injected in the face to add contour and shape to the cheekbones, the brow, and the cheeks. The small muscles attaching to the corner of the mouth were transected to reduce the downward pull on the corners of the mouth. Her postoperative course was uneventful. She's very happy with the results. Her photographs at eight months show an excellent rejuvenation with lifting of the sagging cheek and neck tissues and a more youthful contour in the brow, cheek, and neck areas. 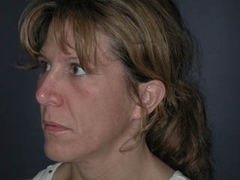 She also had additional light treatments to the skin which had helped improve her skin texture and pores.